It is a good tradition in science to gain insights and build intuition with the help of thought-experiments. Let’s perform a couple of thought-experiments that shed light on some basic properties of the statistics of record-breaking events, like unprecedented heat waves. I promise it won’t be complicated, but I can’t promise you won’t be surprised. Assume there is a climate change over time that is U-shaped, like the blue temperature curve shown in Fig. 1. Perhaps a solar cycle might have driven that initial cooling and then warming again – or we might just be looking at part of a seasonal cycle around winter. 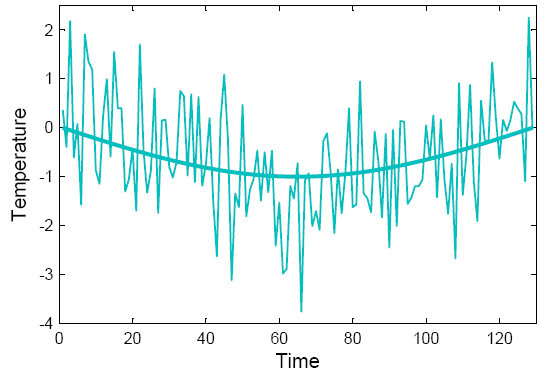 (In fact what is shown is the lower half of a sinusoidal cycle.) For comparison, the red curve shows a stationary climate. The linear trend in both cases is the same: zero. Fig. 1.Two idealized climate evolutions. These climates are both very boring and look nothing like real data, because they lack variability. So let’s add some random noise – stuff that is ubiquitous in the climate system and usually called ‘weather’. 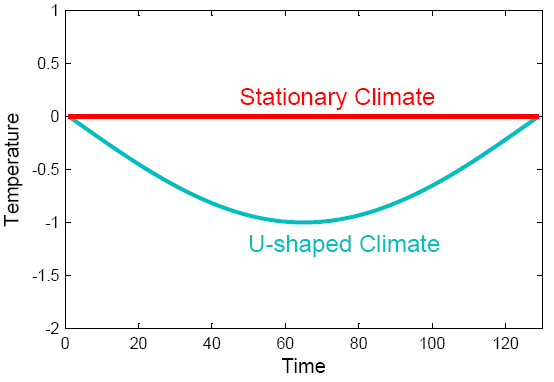 Our U-shaped climate then looks like the curve below. Fig. 2. “Climate is what you expect, weather is what you get.” One realisation of the U-shaped climate with added white noise. So here comes the question: how many heat records (those are simply data points warmer than any previous data point) do we expect on average in this climate at each point in time? As compared to how many do we expect in the stationary climate? Don’t look at the solution below – first try to guess what the answer might look like, shown as the ratio of records in the changing vs. the stationary climate. When I say “expected on average” this is like asking how many sixes one expects on average when rolling a dice a thousand times. An easy way to answer this is to just try it out, and that is what the simple computer code appended below does: it takes the climate curve, adds random noise, and then counts the number of records. It repeats that a hundred thousand times (which just takes a few seconds on my old laptop) to get a reliable average. For the stationary climate, you don’t even have to try it out. If your series is n points long, then the probability that the last point is the hottest (and thus a record) is simply 1/n. (Because in a stationary climate each of those n points must have the same chance of being the hottest.) So the expected number of records declines as 1/n along the time series. Ready to look at the result? See next graph. The expected record ratio starts off at 1, i.e., initially the number of records is the same in both the U-shaped and the stationary climate. Subsequently, the number of heat records in the U-climate drops down to about a third of what it would be in a stationary climate, which is understandable because there is initial cooling. But near the bottom of the U the number of records starts to increase again as climate starts to warm up, and at the end it is more than three times higher than in a stationary climate. Fig. 3. 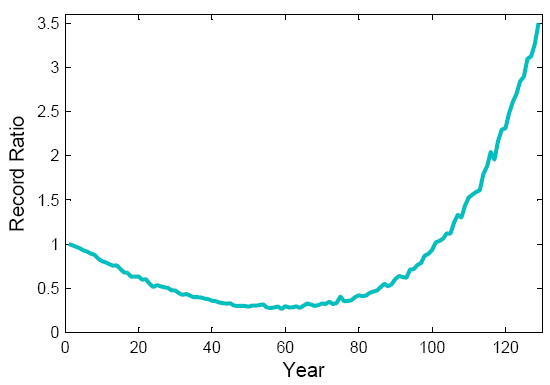 The ratio of records for the U-shaped climate to that in a stationary climate, as it changes over time. The U-shaped climate has fewer records than a stationary climate in the middle, but more near the end. Next, pretend you are one of those alarmist politicized scientists who allegedly abound in climate science (surely one day I’ll meet one). You think of a cunning trick: how about hyping up the number of records by ignoring the first, cooling half of the data? Only use the second half of the data in the analysis, this will get you a strong linear warming trend instead of zero trend! Fig. 4. 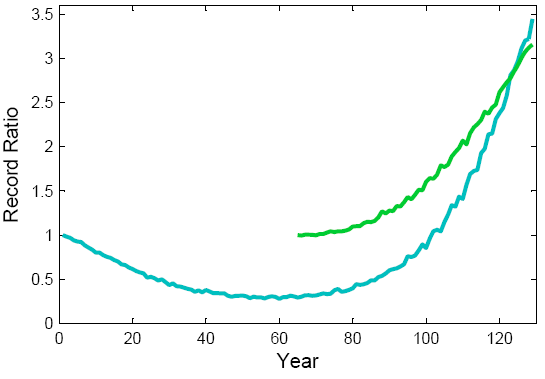 The record ratio for the U-shaped climate (blue) as compared to that for a climate with an accelerating warming trend, i.e. just the second half of the U (green). Oops. You didn’t think this through properly. The record ratio – and thus the percentage of records due to the climatic change – near the end is almost the same as for the full U! The explanation is quite simple. Given the symmetry of the U-curve, the expected number of records near the end has doubled. (The last point has to beat only half as many previous points in order to be a record, and in the full U each climatic temperature value occurs twice.) But for the same reason, the expected number of records in a stationary climate has also doubled. So the ratio has remained the same. So now we have seen examples of the same trend (zero) leading to very different record ratios; we have seen examples of very different trends (zero and non-zero) leading to the same record ratio, and we have even seen examples of the record ratio going down for steeper trends. That should make it clear that in a situation of non-linear climate change, the linear trend value is not very relevant for the statistics of records, and one needs to look at the full time evolution. That insight brings us back to a more real-world example. In our recent PNAS paper we looked at global annual-mean temperature series and at the July temperatures in Moscow. In both cases we find the data are not well described by a linear trend over the past 130 years, and we fitted smoothed curves to describe the gradual climate changes over time. In fact both climate evolutions show some qualitative similarities, i.e. a warming up to ~1940, a slight subsequent cooling up to ~ 1980 followed by a warming trend until the present. For Moscow the amplitude of this pattern is just larger, as one might expect (based on physical considerations and climate models) for a northern-hemisphere continental location. NOAA has in a recent analysis of linear trends confirmed this non-linear nature of the climatic change in the Moscow data: for different time periods, their graph shows intervals of significant warming trends as well as cooling trends. There can thus be no doubt that the Moscow data do not show a simple linear warming trend since 1880, but a more complex time evolution. Our analysis based on the non-linear trend line strongly suggests that the key feature that has increased the expected number of recent records to about five times the stationary value is in fact the warming which occurred after 1980 (see Fig. 4 of our paper, which shows the absolute number of expected records over time). Up until then, the expected number of records is similar to that of a stationary climate, except for an earlier temporary peak due to the warming up to ~1940. This fact is fortunate, since there are question marks about the data homogeneity of these time series. Apart from the urban adjustment problems discussed in our previous post, there is the possibility for a large warm bias during warm sunny summers in the earlier part, because thermometers were then not shaded from reflected sunlight – a problem that has been well-documented for pre-1950 instruments in France (Etien et al., Climatic Change 2009). Such data issues don’t play a major role for our record statistics if that is determined mostly by the post-1980 warming. This post-1980 warming is well-documented by satellite data (shown in Fig. 5 of our paper). Our statistical approach nevertheless is not in itself an attribution study. This term usually applies to attempts to attribute some event to a physical cause (e.g., greenhouse gases or solar variability). As Martin Vermeer rightly said in a comment to our previous post, such attribution is impossible by only analysing temperature data. We only do time series analysis: we merely split the data series into a ‘trend process’ (a systematic smooth climate change) and a random ‘noise process’ as described in time-series text books (e.g. Mudelsee 2010), and then analyse what portion of record events is related to either of these. This method does not say anything about the physical cause of the trend process – e.g., whether the post-1980 Moscow warming is due to solar cycles, an urban heat island or greenhouse gases. Other evidence – beyond our simple time-series analysis – has to be consulted to resolve such questions. Given that it coincides with the bulk of global warming (three quarters of which occurred from 1980 onwards) and is also predicted by models in response to rising greenhouse gases, this post-1980 warming in Russia is, in our view, very unlikely just due to natural variability. You don’t need a 1,000-page computer model code to find out some pretty interesting things about extreme events. The few lines of matlab code below are enough to perform the Monte Carlo simulations leading to our main conclusion regarding the Moscow heat wave – plus allowing you to play with the idealised U-shaped climate discussed above. The code takes a climate curve of 129 data points – either half a sinusoidal curve or the smoothed July temperature in Moscow 1881-2009 as used in our paper – and adds random white noise. It then counts the number of records in the last ten points of the series (i.e. in the last decade of the Moscow data). It does that 100,000 times to get the average number of records (i.e the expected number). For the Moscow series, this code reproduces the calculations of our recent PNAS paper. In a hundred tries we find on average 41 heat records in the final decade, while in a stationary climate it would just be 8. Thus, the observed gradual climatic change has increased the expected number of records about 5-fold. This is just like using a loaded dice that rolls five times as many sixes as an unbiased dice. If you roll one six, there is then an 80% chance that it occurred because the dice is loaded, while there is a 20% chance that this six would have occurred anyway. To run this code for the Moscow case, first download the file moscow_smooth.dat here. Mudelsee M (2010) Climate Time Series Analysis. Springer, 474 pp. Dan H. might want to find out where that image comes from originally — what data, when, by whom; it’s much blogged, but I didn’t chase that particular red herring down once I saw how much it’s been reused. I must love the smell of red herring in the morning — it was too tempting. I mainly posted that link to show how many records are really occurring so we could think about what is extreme. We would indeed expect the ratio of highs to lows to go in the direction of the temperature trend. We also might expect more record cold in the 30s as the temperature record really only goes back to 1880s with large numbers of thermometers and without using proxies. The 30s were extreme when it came to records but so are the 2000s, and when measured just by record temperatures part of the reason has to be warming. Now there is another point to this all. If we describe extreme a different way do those extremes in the 1930s like the dust bowl still lock extreme in the world of 2011. They definitely do to me. I live in Texas, and this summer has been catagorized as extreme. I would agree, but my city and state did not break the record high for the year, but did break many daily highs and had very little rain. But even given the summer of 2011s extreme we would still consider the dust bowl in the 30s and the decade without rain in the 40s and 50s to be extreme. I wonder if Capital Climate could round up the full year’s result for 2010? and 2011 in a couple months? Dan H. keep in mind that the plethora of new highs are all higher than anything in earlier decades including the 30’s. See Figure 7 bottom right panel of the Hansen paper. It wouldn’t surprise me if US records weren’t currently beating previous decades. Although the NCAR article linked to in #146 should give anyone pursuing that line in an honest fashion pause for thought. Dan, thank you for clarifying–though it wasn’t necessary to explain stacked columns. If I understand you correctly, you agree that climate is currently warming, but are skeptical that there are more extremes occurring in general. Yes? You speak about the absolute numbers of US records. I had a quick look, but found no survey of them over the decades. It sounds as if you have. Care to share? The original shows that the data are for *monthly statewide high records. * That is, if any station anywhere in the state has a record high, then that state is considered to have a record high for that month; otherwise, no record. Hence, there are 12 months x 50 states, or 600 “opportunities” for records per year. (Presumably modern definitions of “states” are extended backward to the beginning of the record.) I’ll leave the statistical heavy lifting to others, but it would seem that this individual methodology would necessitate care in making comparisons. I notice he updated in 2009, but not since. Pity. It would certainly be interesting to see what 2010 and 2011 looked like through this particular lens. Repeatedly one reads that our atmosphere has 4% more water vapor in it, and that this fact contributes to greater precipitation and more catastrophic weather events. But the 4% figure seems small in comparison to the magnitude of the deluges experienced in so many places recently. Surely the 4% extra atmospheric H2O is not evenly distributed in the atmosphere. Aren’t some places just as arid as before and other places finding themselves (or their weather) with atmospheric H2O boosted much more than 4%? Shouldn’t this point of clarification be made when catastrophic weather is discussed? Scott Ripman @159 — Yes and there are many papers on the subject of rainfall. Briefly, precipitation has increased in mid and high latitudes and seems to be decreasing in the so-called subtropics. The latter includes all across the American south and all around the Mediterrean. Moreover, it may be that increased aerosols lead to more extreme rain events; I left a link regarding that on the Open Variations thread. Also there is a link by Hank Roberts indicating a tendency to increased extreme events in the Mediterrean region. But excessive rain and flooding are also a growing problem: See my comment # 29 under Scientific Confusion earlier today. atmosphere impact the global hydrologic cycle; however, disagreements on regional scales are large, and thus the simulated trends of such impacts, even for regions as large as the tropics, remain uncertain. The present investigation attempts to examine such trends in the observations using satellite data products comprising Global Precipitation Climatology Project precipitation and International Satellite Cloud Climatology Project cloud and radiation. Specifically, evolving trends of the tropical hydrological cycle over the last 20–30 years were identified and analyzed. The results show (1) intensification of tropical precipitation in the rising regions of the Walker and Hadley circulations and weakening over the sinking regions of the associated overturning circulation; (2) poleward shift of the subtropical dry zones (up to 2° decade−1 in June‐July‐August (JJA) in the Northern Hemisphere and 0.3–0.7° decade−1 in June‐July‐August and September‐October‐November in the Southern Hemisphere) consistent with an overall broadening of the Hadley circulation; and (3) significant poleward migration (0.9–1.7° decade−1) of cloud boundaries of Hadley cell and plausible narrowing of the high cloudiness in the Intertropical Convergence Zone region in some seasons. These results support findings of some of the previous studies that showed strengthening of the tropical hydrological cycle and expansion of the Hadley cell that are potentially related to the recent global warming trends. I would also keep in mind that in terms of the warming trend the United States has been very fortunate so far. In terms of five-year averages we are still pretty close to where we were in the 1930s, but much of the world left the 1930s behind a long time ago. For the Northern Hemisphere as a whole, the last the time the 5-yr running mean was equal to that of the late 1930s was about 1985. Globally? About 1978. … while mean precipitation increase was barely visible during the past century (and was statistically insignificant in the cold season), heavy and very heavy precipitation increased markedly as did the proportion of their totals attributed to these events. Regionally and seasonally, changes in “very heavy” precipitation vary significantly, and are most notable in the eastern two-thirds of the country and primarily in the warm season when the most intense rainfall occurs (Figure 6). Our results provide to our knowledge the first formal identification of a human contribution to the observed intensification of extreme precipitation. We used probability-based indices of precipitation extremes that facilitate the comparison of observations with models. Our results also show that the global climate models we used may have underestimated the observed trend, which implies that extreme precipitation events may strengthen more quickly in the future than projected and that they may have more severe impacts than estimated. … although they seem to underestimate the actual trend. But in my view drought is far more important. There will be the drying out of the continental interiors, particularly during summer. As I said earlier, ocean has greater thermal inertia than land. It takes longer to heat it up or cool it down. And in a warming world this implies land will warm more quickly than ocean. Thus the relative humidity of moist maritime air will drop more quickly than before as it moves inland and with it the chances for precipitation. In contrast, precipitation may increase during the wintertime. But with an earlier melt this will imply flooding. And at higher temperatures earlier in the year the moisture will tend to evaporate more quickly, leaving less moisture for later in the year. Reduced moisture during the summer will imply a reduction in moist air convection at the land’s surface. This will imply higher summertime temperatures and in time a net decrease in plant productivity. As measured by the Palmer Drought Severity Index (PDSI), we have observed the drying out of land on a global scale. However, the PDSI suggests there has likely been a large drying trend since the mid-1950s over many land areas, with widespread drying over much of Africa, southern Eurasia, Canada and Alaska. In the SH, there was a drying trend from 1974 to 1998, although trends over the entire 1948 to 2002 period are small. Seasonal decreases in land precipitation since the 1950s are the main cause for some of the drying trends, although large surface warming during the last two to three decades has also likely contributed to the drying. Based on the PDSI data, very dry areas (defined as land areas with a PDSI of less than –3.0) have more than doubled in extent since the 1970s, with a large jump in the early 1980s due to an ENSO-induced precipitation decrease over land and subsequent increases primarily due to surface warming. Then there is drought driven by the expansion of the Hadley cells. I don’t know how well the models are doing at modeling this expansion now, but previously it was noted that the Hadley cells were expanding at roughly 3X the rate projected by the models. With Hadley Cells, moist air rises in the tropics, gives up its moisture as it cools with increasing altitude, then subsides once it has given its moisture at roughly 30 N/S of the equator. This may very well be a factor in the recent Texas drought. Dallas is at about 32 N.
Drought will likely have the greatest effect upon our food supply, and we have already observed a net global decrease in plant productivity. This global shift in plant productivity is an expected result of global warming, but we didn’t expect it so early. “… the end-Permian extinction was extremely rapid, triggering massive die-outs both in the oceans and on land in less than 20,000 years … coincides with a massive buildup of atmospheric carbon dioxide, which likely triggered the simultaneous collapse of species in the oceans and on land. … the average rate at which carbon dioxide entered the atmosphere during the end-Permian extinction was slightly below today’s rate of carbon dioxide release into the atmosphere due to fossil fuel emissions. Those are all valid explanations for the recently observed temperature increases, and generally accepted (although there are a few who will deny them). #163–Thank you, Timothy Chase. Good information, as usual. The Zhao and Running was interesting, if not particularly cheery, and I’d missed it completely. #165–Dan, to what does “those” refer? I really don’t know what you mean. “Those” aren’t happening now — “anything but the IPCC” requires _two_ hypothetical forcings — one to cancel out the known physics explaining the effect of increasing CO2, and another to explain the facts by something besides CO2. “Those” from the PETM — except the rate of change of CO2 — aren’t happening. Might make for interesting discussion at some point. There has been some movement on the other points as well. I might try to get back to them a little later. Those oil-rich black shales we hear so much about lately? They were laid down in anoxic conditions. Does this mean that by pushing climate to the kind of anoxic ocean that Peter Ward warns of, we’re setting up conditions to restore the Earth’s petroleum supply over the longer term? That would be good news for the descendants of, you know, the opossums or squids or whatever form of intelligent live eventually evolves on this planet. I was responding to SirCharge where he stated that the difference between last years heat wave and the earlier heat wave (1936) was that Moscow has been built up significantly since then, such that the increase above 1936 levels could be attributed to steel and asphalt. The “plethora” of new highs mentioned earlier are largely the result of more stations being in existence. Many of the neighboring stations which recorded record highs in 1934 or 36 did not record records recently. Your assessment about my beliefs in #157 are correct. Watts’s ‘surface stations’ notion failed for the US — he’s been shown wrong. You assert it now for Russia, because — why? More thermometers used, and you assert this makes temperatures go up? “Scientists finally know the date — and hence the likely cause — of a massive extinction that wiped out 95 per cent of life in the oceans and 70 per cent of life on land …. Most affected species met their demise within 20,000 years — a blink of an eye on the geological timescale. In all, the mass extinction lasted less than 200,000 years, wiping out huge forests of conifer trees, tree ferns, big amphibians, large reptiles such as dimetrodons, mammal ancestors called synapsids and a huge diversity of fish and shellfish. “… the end-Permian extinction … coincides with a massive buildup of atmospheric carbon dioxide, which likely triggered the simultaneous collapse of species in the oceans and on land. #170–Thank you, Dan. I still can’t find his comment, but no matter. Have to say, UHI as an explanation doesn’t really wash, if that was the point. Temporally, 30s Moscow may have been less built up, but wasn’t Rahmstorf et al referring to ‘the Moscow station?’ In that case, we’d need to see what the temporal structure of the ‘build up’ *around the staation* was before proposing it to have some explanatory value. All those forest fires weren’t due to asphalt being solar-heated. . . I just said that his explanation was plausible. Moscow broke its all time record high by 1.5C. The summer of 2010 was similar to the summer of 1936. I cannot say whether the record broke the previous highs because of the urban buildup, an extended blocking event, or global warming. Likewise, I will not make an assertion that the U.S. did not break their record highs for any of the above reasons. I will maintain that these types of record highs are not the result of an increasing mean, but rather a specific weather event, whose frequency of occurance has not changed. When the weather event (blocking) occurs, specific local conditions will determine whether new records are broken. Russia broke many records in 2010. In the U.S., many of the 1936 records still stand. arguable, at least, which may be closer to what you’re looking for. Plausible, only by ignoring the infrared absorbtion physics — the same physical behavior that makes your laser CD player work. #174–Well, of course there are specific “local” causes when records fall. But that doesn’t mean that the bigger context isn’t important, or doesn’t contribute to the outcome. Exactly! Much of the warming trend has been attributed to higher low temperatures. This has resulted in an increased mean with a smaller standard deviation. If you go to the NOAA weather site and check the records for 2011, the monthly high maximum temperatures have outpaced the low maximum temperature 527 – 324. However, the monthly high minimum temperatures have exceeded the low minimum temperatures 781 – 240. More of the observed warming can be attributed to an increase in minimum temperatures. “The eight warmest years on record (since 1880) have all occurred since 2001, with the warmest year being 2005. A question for you. Hank’s post claims that minimum temperatures have risen faster than maximums, yet there is no claims of gibberish, or unsupported opinion. Yet, when I show actual numbers that says the same think, with a reference, it is called, “unintelligible nonsense.” Therefore, do you feel that Hank is as confused as you claim I am? He’s such a mixer, and so eager for attention. Not worth much though. He doesn’t cite sources, so you can’t see the context for what he says. He consistently provides fake context so when he does post something factual, its meaning for a naive reader is — bent, distorted. That’s how ‘out of context’ and ‘unsupported’ claims are useful — to delay and confuse. Climate models [tell us that] minimum temperatures should be rising faster than maximum temperatures if human-caused emissions of heat-trapping gases are responsible for global warming, which is in line with what we are seeing in the U.S. using the CEI. The Annual Climate Extremes Index (CEI) for minimum temperature, updated through 2010, shows that about 35% of U.S. had minimum temperatures much warmer than average during 2010. This was the 7th largest such area in the past 100 years. The mean area of the U.S. experiencing minimum temperatures much warmer than average over the past 100 years is about 10% (thick black line.) Image credit: National Climatic Data Center. Ten key messages from the IPCC Special report on extreme events. not quite as being depicted in the craposhere. You’re doing the apples to oranges thing. That there is a lower difference between daily highs and daily lows does not change the standard deviation of daily highs, daily averages, or daily lows in and of itself. The whole question of whether a single event was caused by global warming is moot. Every day for a region is completely different due to AGW, including very cold days that wouldn’t have occurred without AGW. The 2010 blocking event? Wouldn’t have occurred without AGW. Of that we’re essentially certain. Another blocking event that didn’t happen in August 2007? Might have occurred without AGW. We can say with certainty that we’ll get more Moscow warming type events with AGW, but the dates of their occurrences will be completely different compared to a non-AGW world. If we get 5 times as many of these events in a specific AGW world, then the odds are that none of those 5 events will coincide with the 1 event we would get without AGW. Thus, AGW both prevents and causes heat waves. 100% of the weather we get is completely different because of AGW and there is no way to guess what the weather would have been without AGW. All we can determine is means and variability. Hank pointed out that if the mean increases due to AGW, then the only way to get fewer extreme highs is by lowering variability. That’s correct whether we’re talking daily high, mean, or low temperatures. That’s a good question for the moderators – does AGW change variability? Of course, all this breaks down if we drive temperatures high enough that heat waves which had 0% probability without AGW start occurring. How can you be so certain that the 2010 blocking event would not have occurred without AGW? The records that were broken last year were set in 1936, in what many assert was a similar blocking event. A similar situation occurred in the U.S. See the link to which Kevin posted in #184, comparing the two hottest summers in the U.S. in the 1930s with those of the past decade. AGW did not cause this recent blocking event any more than it cause a similar occurrance 75 years ago. I am curious how you can say that we know with certainty that these events will increase in the future. Thanks for the link. I just wish Hansen had expanded his graphs further back in time. His figure 8 indicates that there may have been much greater spread in the data in previous years. Open Mind takes on what I have argued is the critical “final common pathway” of global warming risks — crop and supply chain failures …. ‘Why did the Russian wheat harvest suffer so? Because of the record-breaking heat wave and drought which plagued a massive region, at just the wrong time for Russian agriculture. And one of the contributing factors is: global warming. Oh, for those tracking the tactics of assertion without citation, compare the assertions posted above without any source to what you find looking for information from sources. Yes, you’ll find crap sources out there that the deniers fall back on when pressed for any citation. Stay with the science sites and avoid the “worldclimatereport” kind of spin sites. “The western Russia heat wave during summer 2010 was the most extreme heat wave in the instrumental record of 1880-present for that region…. Here we provide the various stages of one such scientific assessment …. … a chronology of the scientific investigation, including questions asked, hypotheses posed, data used, and tools applied. The effort began with a rapid initial response, assembled as preliminary material and discussion as a web page, which can be read under the header Preliminary Assessment that was last updated 9 September 2010. … the team posed the rhetorical question whether the western Russia heat wave of July 2010 could have been anticipated. The nature of this analysis was more extensive that the initial rapid response, and the vetting of our analysis was conducted through the peer review process leading to the publication of a paper in Geophysical Research Letters in March 2011. The contents of this paper including the Supplemental figures that accompanied the work can be read under the header Published Assessment. The assessment process continues at NOAA/ESRL, and we provide further ongoing analysis …. we attempt to reconcile several differing perspectives on the causes for the heat wave, illustrate the diversity of questions being posed and how answers to those may at times confound the public (and even scientific) understanding of causes. Remember how science works. There’s no great original founder on which everything later is based, and this is a good example, citing work and assessing whether what appear to be contradictions or disagreements can be drawn out with more work to get closer to a better description of what happened. Science doesn’t grow like a single tree, it grows like kudzu. Let’s use Hansen’s visualization that weather is like rolling dice. An extreme blocking event of a specific magnitude starting on a specific day in a specific area and lasting for a specific duration might be like rolling a 6 100 times in a row. Very very unlikely. The key is that the system without AGW represents a new reality, and so the two (with AGW VS without AGW) are independent events. That there was such an event in our reality has zero influence on the odds of such an event at the same time in the alternative reality where humans never emitted any CO2. Thus, we MUST re-roll those 100 dice! Depending on how picky you want to get in the definitions, one could say it would be impossible to get the same results. Another way to think about it is GCMs. Do runs all starting 10 years before the event until you get the event in question. Now change the parameters to represent no AGW. Do ONE more run. What are the odds of getting the same event? Essentially zero. Thus, it is incorrect to say that the 2010 event would have been “the same” but a little lower temperature without AGW. It is correct to say that without AGW the 2010 event would not have occurred. Without AGW, 100% of all weather on the planet would be different from what occurred, including the heat waves that did not occur because of AGW. Oh, pathetic; Dan handwaves “from NOAA” and quotes from the 2010 publication. That works because people won’t have a link and see the explicit pointers to more recent work on the same page. This is how obfuscation works; claim what seems to be almost a cite to a good source, but quote a bit out of context, so anyone not skeptical can be fooled into thinking it’s up to date information. I believe Hank’s point. With an increased mean and constant variability, the number of extreme highs will invariably increase. This is true regardless of whether climate sensitivity is 1C or 3C or 6C. To counter this, you’ll have to provide some evidence that weather variability will decrease as global mean temperature increases. I’m assuming you aren’t proposing that climate sensitivity is 0C or below. I have to say, Dan H. is really good at what he does. He takes a graph from a blog and posts a link to the image, making up a claim about it. The blog he took the image from is gailtheactuary — Gail Tverberg. You could look at the source — if you take the time to figure that out, because Dan won’t tell you where he got it. Nor will he tell you what the caption says, nor how to find what the author had to say about the chart. I’m tired of chasing Dan’s stuff. In case you did not notice, the quote that I posted was from the abstract of the same publication to which you referenced in post #188 (i.e GRL, March, 2011). Do you have the link to a more recent publication? None of your commentary, just facts please. If you have any other publication that shows another explanation, I would like to see that also. It would be nice to back up assertions with facts. On this page the first graphic is a copy of figure 2 from Barriopedro et al. Notice how 5 of the years in the last 10 years are at the very warmest edge of the distribution, or beyond it. Notice also the mini-graph below the main graph of the statistical distribution. Barriopedro find that when taking into account the uncertainty ranges in proxy reconstruction of temperature; “at least two summers in this decade have most likely been the warmest of the last 510 years in Europe.” That is significant because those uncertainty ranges are large. On this page you’ll find part of one of the graphics from the recent Hansen paper. This shows that not only is there a shift due to the warming trend, but there is also an increase in the high end, i.e. extreme warm events. Note in particular the top graphic there; that’s for summer which is the season being discussed. Never mind the discussion on those pages, you can discuss those over there if you want, but you’ll also find links to the papers involved. As a former sceptic (I was quietly in denial) I still have some doubts about the models, I suspect you do too. So lets leave aside considerations based on models. Barriopedro et al’s argument about incidents like the Moscow 2010 heatwave being unlikely to recur for decades is based on model results, and a key thread of the NOAA argument is again based on models. The element of the NOAA argument that isn’t is how much of an outlier 2010 was (top graphic). But Barriopedro figure 2 shows us that of the last 10 years in Europe five have been at the very top end of the statistical distribution, and Hansen shows us that globally there has been a massive increase in high sigma warm events. What conclusions do you draw from the observations I outline – no quote mining from other sources – what do you think? > to a more recent publication? None of your commentary, just facts please. >> … follow the links they give at ESRL …. I quoted their directions at length for how to find that material. Certainly the report signals a need for countries to reassess their investments in measures to manage disaster risk. New disaster risk assessments that take climate change into account may require countries and people to refresh their thinking on what levels of risk they are willing and able to accept. This comes into sharper focus when considering that today’s climate extremes will be tomorrow’s ‘normal’ weather and tomorrow’s climate extremes will stretch our imagination and capacity to cope as never before. Smart development and economic policies will need to consider changing disaster risk as a core component unless ever more money, assets and people are to be washed away with the coming flood. While both the authors of this blog are Co-ordinating Lead Authors of the IPCC Special Report on Managing the Risks of Extreme Events and Disasters to Advance Climate Change Adaptation, and members of the Core Writing Team of the Report’s Summary for Policy Makers, the article does not represent the views of the IPCC or necessarily of either of the author’s host organisations.